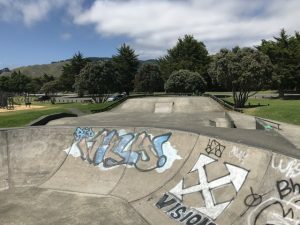 If you’re at the township of Waikanae, rather than the beach area or if you just fancy a change from sand and sea, this playground and skatepark are a good option. 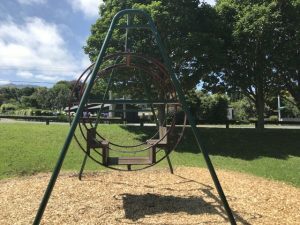 Just round the corner from Waikanae Pool, the playground has a decent size structure of monkey bars, slide, rock climbing wall, rope and metal ladders and a flying fox. There’s a smaller pre schooler structure with naughts and crosses, little ladders, abacus, mini slide and small tunnel. Elsewhere in the park, there is a double circular swing, seesaws, larger tunnel slide, roundabouts, swings, and an old school Maypole. There is some shade at different times of the day and a couple of picnic tables. The Skatepark is within sight of the playground although perhaps not in shouting distance. There’s a bowl, various ramps, quarter pipe and rails. There’s plenty of grass around and space to run around, fly a kite etc. There are also sports fields with adult exercise equipment behind the skatepark and an ‘off leash’ dog park near the pony club. There are toilets near the club rooms. Address: corner of Ngarara Road and Park Ave. Car parking available on both streets and in little parking areas on Park Ave.